TEAM BUILDING – WHY NOT TRY IT? The reason that all kinds of groups engage in dedicated team building activities is because strong bonds produce more successful outcomes. A Team event has a positive effect on the morale, motivation, confidence and effectiveness of the team and its individual members that immediately transfers to the workplace. And last but not least : A better life. Go wild; all want to be the hero team! 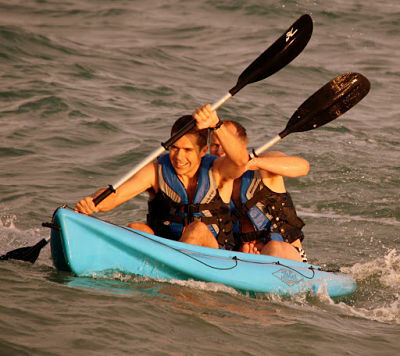 An exciting circuit of fun teambuilding challenges all designed to build team camaraderie and spirit! After a first step of Ice – Breaking Games, the team will be ready to face any team challenge! They will have to face it in many different ways. Each Team receives a name and a colour and will have to compete ferociously against the others… while having an unforgettable experience, full of fun and laughters. We can organize the games outdoors or indoors, on beaches or in our installations in Comarruga (45 minutes from Barcelona). The teams meet on the beach of Castelldefells, Sitges or Comarruga and are divided into groups, no need to be in top shape, only bring your good mood and lots of positive energy! 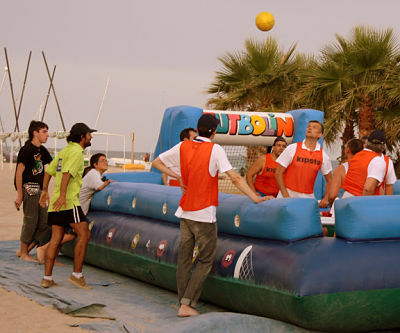 Games such as “Team Volley”, “Ski Slalom”, “Buiding of a catapult”, “the message”, “The Naval Battle” and “Human Table Football”. From 8 to 300 pax. With OKTeam we organize treasure hunts in Barcelona, Sitges or Barcelona in Spanish, English, German or French. They are conceived for groups from 8 up to 200 persons (or more). For companies and also great fun for groups of friends, family celebrations, Hen or Stag parties etc…. The TREASURE HUNT is an excellent and exciting way to discover our most beautiful cities such as Barcelona, Sitges or Tarragona. You may learn about them in an active and unconventional way while having fun, “competing” against other teams. This game ispossible as an outdoor or indoor activity: Everyone loves watching commercials – and even more if you created them yourself! Imagine your team creating a memorable commercial spot including the jingle and everything that belongs to it! Teams will have the opportunity to write their script, aswell as create and shoot their very own commercial. “I want my MTV!” Join in the fun as teams are asked to choose a popular song. After receiving detailed instructions, each team is on it’s own to create the coolest “lip-dub” music video ever! Team captains are selected to act as Music Video Directors. The goal is to have all team players perform within the video! Each member will receive it’s own PENDRIVE as a gift at the end of the activity. Enjoy it! Your Dr. Clue treasure hunt is designed for your most analytical and creative team members—folks who make their living “hunting” for patterns and analyzing data. We’ll tell you straight away, our treasure hunt clues are pretty darn challenging… as they HAVE TO BE in today’s competitive marketplace. IS YOUR TEAM UP TO THE CHALLENGE? Try to find the criminal helping our C.S.I. police officers. Teams are devided into groups and and compete against each other in Team Building Activities, which are designed specially to help groups develop effective communication & problem-solving skills. With each game the teams can win clues in order to resolve the Dr. Clue Mystery! Healthy, non-ridiculing and connecting laughter physiological, psychological and spiritual benefits you probably never realized or imagined. We are born with the gift of laughter -it’s being serious that we learn. So, learn to laugh, and live, all over again. Stress – reducing Games, Simulations, Team Improvising, and all sorts of silly games that you and your team will remember forever! – Barcelona : Cook Paella with your team in the cooking workshop on the Ramblas – Fish Paella – Meat Paella – Vegetables Paella – which one do you prefer?